Luxurious vacationing right on the beach and only steps to the sand! Very Recent Remodel. Be one of the first guests to stay in the most exceptional condo at Kanai A Nalu! 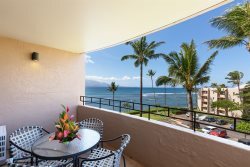 This 2 br/ba 4th floor condo beach retreat is located at the popular Kanai A Nalu complex in the quaint harbor village of Maalaea! There is direct beach access to the longest sugary golden beach on Maui that's suitable for all water activities and watching whales (during whale season). Recently transformed from a set of 4 bare concrete walls and floors to a modern beach front oasis rivaling many of the island’s luxury hotels. This condo has an open, spacious floor plan with a large open kitchen where you can enjoy ocean views while you cook for and entertain your guests as they sit around the kitchen island, or anywhere else in the unit. The kitchen has modern stainless steel appliances and a very contemporary bold look with wood cabinets mixed with stainless steel and glass doors and bright quartz counter-tops. Featuring cool porcelain tile floors throughout in a white/grey scheme with recessed ceiling lighting throughout to provide that comfy warm look and feel at night. The bathrooms feel spacious with lots of natural light coming through the combination of French doors and glass block walls (letting light in, but ensuring privacy). Both baths include double vanities, so no fighting. The master bath has a large walk in shower while the other bath features a sumptuous slipper tub for those wanting that relaxing bath. Both baths will be ensuites. Both bedrooms have king size beds, modern, comfortable furnishings and their own TV. The master bedroom opens to the living room/dining area through a sliding wall to extend the feeling of the spacious, open floor plan. The unit is furnished with contemporary furniture featuring solid dark wood tables and chairs with a more traditional look to very modern look to the soft furniture like couches and love seats (in striking blue colors). Doors are a combination of solid, hand carved teak to modern French doors. And did we mention the lanai? The spacious lanai will be where you want to spend all of your time enjoying the gorgeous ocean views. The condo has air conditioned with a state-of-the-art system residing within the walls/ceilings and providing individual controls between the main living area and each of the two bedrooms. Didnt want to leave! Having never been to Maui, we didnt know what to expect. We loved it! The accommodations were ideal for us, as we werent interested in staying at a large resort. The sparsely populated beach had excellent views and snorkeling. Mornings were spent watching the sunrise from the lanai. The condominium is very comfortable and updated with every amenity you will need. Eateries within walking distance were great. Its a short drive to Kihei and Kahului for anything else needed. The only thing we needed was more time! Cant wait to come back! This condo had everything and more! We loved it and cant wait to come back! Super comfy for our family of 4. Loved the beach chairs and boogie board they had available! Thank you for all of the special touches! We felt right at home! Wonderful!!! This condo was perfect in every way! It was comfy, clean, and the remodel was beautiful!!! The location was perfect also!! Hated to leave. The pool was amazing and the beach right outside was perfect. We loved everything about it. Beautiful place! Loved this condo! Had everything we needed and wanted! Was so nice to have a big beach bag to use. Perfect location! Thanks so much! comfortable condo We enjoyed our time in the spacious 2 bed, 2 bath condo. We loved that we could wake up and have our morning coffee out on the patio while overlooking the pool and the beach. The ability to cook our meals in the fully equipped kitchen was also a plus. They have thought of everything from beach chairs to umbrella. Had a great time in Maui!!! Our first time to Maui and we loved it!!! The condo was great!!! Location was in the middle of everything we would want to see - it was all just a short drive. And it was stocked with all items needed for a family vacation in Maui. We especially loved the binoculars which we had out on the patio each day to do some whale watching while eating breakfast!!! It was clean, beautiful and was exactly as pictured. We would definitely return and try to use this same condo again!!! Space is very clean, updated, and well appointed. Central to the entire island of Maui. Steps from the beach and short drive to shopping, restaurants, hiking and adventure. We had a wonderful time and would stay here again on our next adventure to Maui if available. The location was great, wonderful beach view from the condo, central to all the areas in Maui, awesome (deserted) beach just steps away. The staff was exceptionally accommodating and communicative and went above and beyond to make our stay wonderful. Thank you.